Note: If you go through any external link, like these above, you won't have paywall issues. Right click each > open in new tab. You can also use incognito mode. My model takes an aggregation of expert rankings from fantasypros, and passes the data into a machine learning clustering algorithm called a gaussian mixture model. Then, I plot each player in the two dimensional space of weighted expert consensus rank (ECR) and raw average rank, and color them by the tier determined by the algorithm. Match-ups are accounted for. The result is beautiful charts and tiers that help you set your line up. 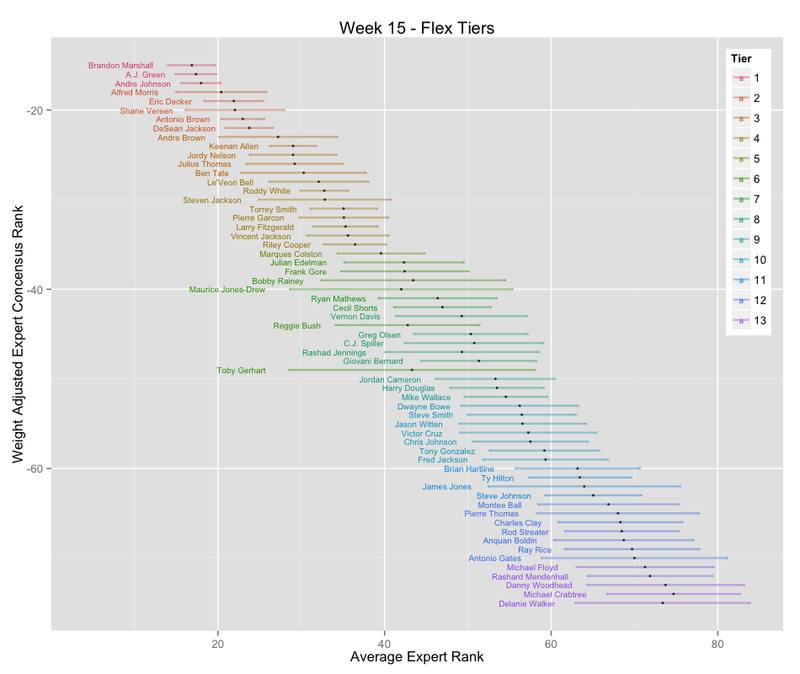 Why the model is powerful: Every week, fantasypros collects data from over 130 experts, each of whom watch and analyze football for a living. 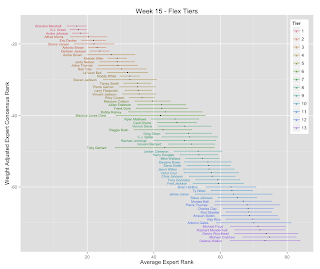 Both fantasypros and my model build on the intuition that an aggregation of many expert opinions provides more reliable rankings than what any one expert can predict. On top of this, the clustering algorithm is able to identify players that are ranked similarly in the data and find natural tiers among the players. It is not always the case that QB3 > QB4 > QB5. Sometimes they are equal, and the algorithm uncovers this. How to use the charts: Each black dot represents the player's average rank and weighted ECR. The color corresponds to the tier given by the algorithm. I recommend starting players in higher tiers. Within a tier, most player will appear close together. This means experts are near 50/50 on who is better this week. The tiering algorithm says these players are equals this week. In this case, I recommend flipping a coin, or going with your gut. If experts can't agree, there is no right answer. As always, you can catch my updates on twitter.